Last major update issued on March 15, 2019 at 18:30 UT. The geomagnetic field was quiet to unsettled on March 14. Solar wind speed at SOHO ranged between 310 and 348 km/sec. 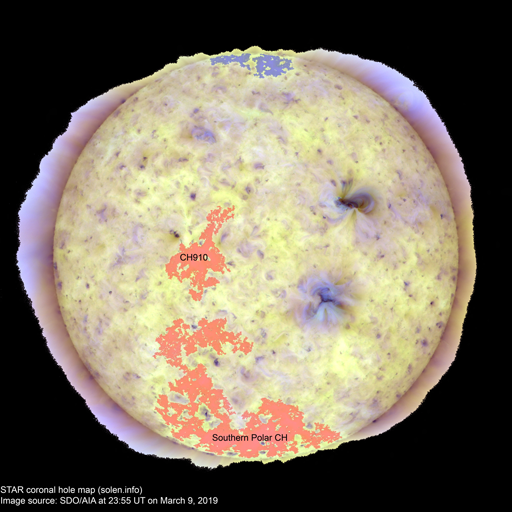 At the time of counting spots (see image time), spots were observed in 1 active region using 2K resolution (SN: 12) and in 0 active regions using 1K resolution (SN: 0) SDO/HMI images. New region S6138 [S42E09] emerged with several spots. March 12-14: No obviously Earth directed CMEs were observed in available LASCO imagery. A trans equatorial coronal hole (CH911) will be Earth facing on March 14-15. The geomagnetic field is expected to be quiet to unsettled on March 15 and quiet on March 16-17. Quiet to unsettled is likely on March 18-19 due to effects from CH911.